I wholeheartedly agree that the magnitude of blame should be placed on the owners and trainers of wayward pit bulls. Therefore, I think an outright ban of the breed wouldn't do much good . A permit system of some sorts might help at least in keeping track of pitbull owners and help victims such as you and Molly track down and hold accountable the owner and pet alike. Kudos for the generosity & forgivenesss you have for your fellow canines. Good to see you Hank! Now you've got me thinking - perhaps there is a huge difference between the pits of today and the pits of the 20s and 30s - because of the breeding. There must be some reputable breeders out there though. Four-foots need training, but humans need training - perhaps more so than four-foots. I've seen some folks do incredibly mean and stupid things to their four-foots. I don't understand why though. And I wonder sometimes if training would help elimnate that - or are some humans just impossible? But I'm so glad you're looking well! Hope Molly is fine too. Well said Hank! And, may I say, quite a handsome and charming picture. I'm glad you seem to have recovered so well. Amen to that, Hank. Great post, and I'm glad you're feeling better. Hank, great to see you back smiling again. Humans often create problems when messing with nature. Glad you're feeling better! Much thanks for that info,And we are glad that you are feeling better. Sorry to read about the attack on you and Molly. I am very glad that Molly was not injured and that your injury is healin'. As my secretary was readin' your great op-ed piece to me, it got me to thinkin' about my attitude towards LWDs (Little White Dogs). An all white dog (Sorry to all the white dogs out there.) is not a natural color for a dog. A polar bear, yes. A beluga, yes. I am use to seein' the shape of a dog in the colors of browns, blacks, greys, tans, golds, rusts, etc, and white patches with the aforebarked colors. Seein' something all white seems very strange. Something without color is runnin' towards me. It is shaped like a dog but it is not colored like a dog. All I can do is prepare myself for a possible altercation or flee. Last weekend my secretary was talkin' to another canine guardian and the subject of LWDs came up. It turns out my behavior towards white dogs is not all that abnormal. Apparently, at times, white dogs can seen by other dogs as something strange. They appear as a negative shape which freaks some dogs out. It was mentioned to my typist that a well known dog trainer had stated a similar view. He said the best way to handle such a situation is to avoid white dogs. So that's what I do. I know I may be missin' out on makin' a new friend but white freaks me out. My dad does not own me. He is legally my Guardian. So he has responsibilities towards me as I have towards him. As a guardian, he also has responsibilities towards other dogs, their guardians and those humans unfortunate enough not to have a canine friend. I think the man with the pit bulls, in this case, thinks he OWNS those dogs. That kind of attitude and the mixed history of that breed helped create the incident at 'Gator Lake'. I have seen many dogs leadin' their humans about on those retractable leads. It is impossible to properly control your human with those things. Especially when they are one two one two (30-50) feet behind you. Most laws state a lead of one two one two (5-6) feet is to be used. I use a one two one two (6) foot lead. For the most part it does a good job. I usually play out only one two one two (3-4) feet and that is fine. You notice that they are called LEADS not PULLS. And a very belated HAPPY B-DAY. Get better hank! I have heard about the pit bull bans etc, some times it's not the dog but the way the dog has been brought up, I know some owners like to train their dogs in certain ways. I am a dog and cat lover all the way! Hank! I'm sorry to read about the attack! I hope you are feeling better. My Simon was attacked by a black-lab and that wasn't pleasant either. But I'm terrified of pits. Most often due to the people having them then the dogs itself. And no matter how much people say that it has to do with how they are trained and so forth: they are dogs. And no matter how well trained a dog is: there could be an incident where the instinct takes over. And if the instinct of a pit is what you had quoted on your post: they should not be allowed to be off the leash - ever! I am so tired of people thinking that their dogs are all sweet and well behaved and then when they see Simon (lab mix) they attack him. He’s an old grumpy guy and most often just wants to get his belly scratched, eat, swim, chase rabbits and be left alone by other dogs. You have a big heart Hank! Poor Hank! A greyhound aggresssively chased me and then a pitbull attacked me the first and last time my human took me to a dog park. I was only 4 months month old at the time. I wasn't hurt bad but it sure scared me. We now keep our distance and avoid any pitbulls we see anywhere. Thanks for your good wishes and paw-prayers - they must have worked because Gruffpuppy is feeling a lot better now. I hope you are doing well to buddy! Hank, you speak with a bark of wisdom and forgiveness. hank, damn i hate this happened. but as the good dag you are, you see it in the light of fairness and common sense. what is being proposed here is a ban on dangerous breeds and also, if you have one of these so called dangerous breeds you may not be able to get homeowners insurance. its too bad. in college i had a pit bull mixed dog. 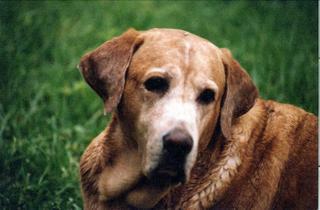 an angel and a good and loyal protector, he never hurt anybody, as you said he had the "look" and that was enough. take care of yourself and molly and know all the dogs over here in this yard are thinking of you. I hope you are feeling better! My human has started a blog anout me aswell! She has added you to her Just lab blog roll if you are feeling better please drop by for a visit. Hank, you are as wise and fair as ever! I hope that others learn from you. 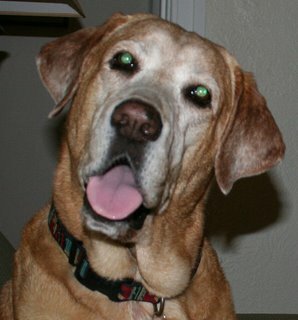 Since you know so many doggies and animal lovers, would you mind linking to the foster dog blog that my mom started?